Chemical and enzymatic reactions can be guided by mechanical stress. 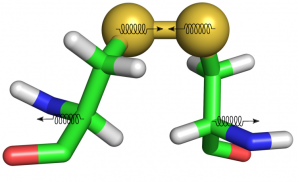 While single molecule force spectroscopy is an emerging technique to study biochemistry under external forces, theoretical knowledge to rationalize or predict the force dependency of reactions rates is limited to simple models. We are examining the effect of force on the electronic and molecular structures and energies during chemical reactions, among others disulfide bond reduction, including quantum and dynamical effects.